Ah yes, there’s definitely peat smoke on the nose! Not on the same scale as heavily peated Islay whiskies, but it’s there. Very similar to the inaugural Wolfburn bottling, where they applied the same technique. Surprisingly mellow for over 60% alcohol! We’ve got light peat smoke, vanilla, coconut, strawberry marshmallows, Kiwi, lime and heather. Light, but in no way boring. Let’s try the palate: Again – 61,2% ABV? Very gentle initially on the arrival. Thick, oily, with a hint of peat and a nice cask sweetness. About 10 seconds in the alcohol starts its attack, but I’ve had harsher tasting 46% whiskies. You don’t actually need water here… Quite creamy and oily, mouth-coating, with vanilla, vanilla pudding, malt, red apples and Kiwi. Let’s try again with water for scientific purposes: Instant Scotch mist! Less alcohol, but it stays creamy, with loads of cask sweetness and light fruity notes. The medium long finish has a nice punch upon swallowing, immediately followed by light peat smoke and a creamy sweetness. This was a fun dram to taste! 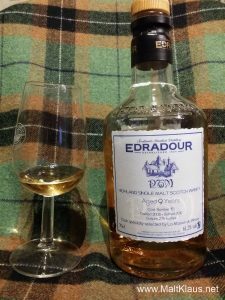 A very good Edradour base distillate matured in an excellent refill cask which also provided a bit of peat smoke aroma. This was bottled back in 2012, so probably unobtainable by now – I hope they’ll repeat the experiment!